This blog site is about Ministry of Electric Power No. (1) from Myanmar. * Minister for Electric Power No. 1 Col Zaw Min visited Yeywa Hydel Power Project yesterday and gave instructions to officials concerned. * At the briefing hall of the project, the minister heard reports presented by Deputy Director-General of Hydropower Implementation Department U Myint Zaw on progress of work and machinery to be equipped at the plant. * After hearing reports, the minister called for timely completion of work on schedule, work-site safety and minimizing of loss and wastage. He also urged the responsible personnel to make efforts and to supervise the machinery to meet the set-standard. 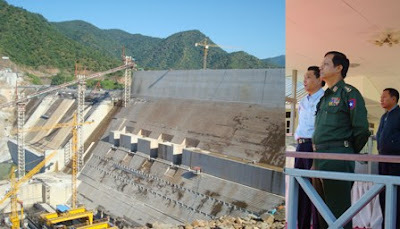 * During the visit, Minister Col Zaw Min inspected placing concrete on the main dam and main spillway, construction of intake channel and installation of machinery. * Ninety-eight per cent of the main dam, 77 per cent of Power House, 28 per cent of the spillway and 71 per cent f the Power Intake have been completed. * The project will cost over US $ 600 million including US $ 200 million from the People's Republic of China as a loan and US $ 400 million from the government. * Upon completion of the project, the power plant is expected to generate 3,550 million kilo watt hours a year and 67 per cent of the project is completed.